Superb as usual. I've come to expect nothing less than outstanding graphics in this series, and MS5 boasts some outstanding new backgrounds and a few new character sprites. The first thing I noticed about this game was just how colorful it is, the first stage in the game is awesome in this regard, with the lush green forest in the background, clashing with the blue river, and a vibrantly colorful canoe that you ride in. Right after this screen you enter a temple that is lit up with torches, giving the environment a nice flicker effect from the flames. Stage 3 really stuck out as well, with its industrial factory theme. All over the place are nicely drawn air vents and ducts, along with crates, boxes and elevators etc. Stage 3 has some really neat little touches that I always like to see, for instance if you look for it, you'll see a big industrial fan in the background, and thru it you will see rays of light coming through as the blades of the fan spin. That’s what it’s all about right there, attention to detail. There have been some hacking of character sprites, but there are some totally new ones. The Jungle guys with the masks look totally new, they run different than soldiers do, and their clothes, plus the mask, are hilarious. I love these guys. They remind me of the jungle men you have to defeat in the 4th screen of Jungle Hunt, complete with masks and spears! They look just like them. Really, this game is completely filled with new enemies to fight, even if some are just wearing new clothes, I think it makes for an interesting new experience. One new addition that sticks out for me that I have a gripe about is on the Water stage, they have redrawn the enemy subs to look more like Nuclear Boomer subs, which is fine, but for some reason when they explode the detail in the explosions is missing. Where there used to be a little smoke and fire, plus an unmistakable effect of the sub 'imploding'...now these kinda just separate into a bunch of pieces and that’s it. They could have put some more detail into that effect. Awesome. This is what everybody is talking about; the Metal soundtrack here is without a doubt, the best soundtrack to date. Metal fans rejoice, and it really kicks in to high gear near the end of the game. The final run-up to the end boss, the industrial stage where you fight shy-guys and various enemy slug-gunners, is extra heavy, it’s like the game is psyching you up for the big finale. The Stage 2 western/metal song is great, but it seems a little out of place since there's nothing western about it. As we have found out by now, we know there are some audio glitches in the game. The most profound one I've heard is the stage 2 elevator screen. When you finish the enemies off, the elevator comes to a crashing halt and there are some explosions, but what you hear is a crackling sound, just like you would hear if your speaker was blown on your TV. There are some new sound f/x I've heard, in particular the enemy helicopters have some sound of their own now when they come into play, they sound like helicopters... what more can I say? You'll hear most of the same familiar screams and explosion noises you've come to expect with the series more over than not. The meat and potatoes of any Slug game, these Slugs are guaranteed to satisfy you, I have no doubt! Just give me the Slug Gunner and I'm a happy man. This thing is sweet. It's basically a super armored version of the 'worker slug' in MS3, as it has the same jump ability, plus it can punch with a big sword, as well as have unlimited gatling gun ammo. Oh yeah, it’s got a tank cannon too, plus by pressing down on the joystick, it transforms into a tank! This just may be my favorite slug ever. You can't miss the casings coming out the back as you unload round after round of ammo on the enemy -it looks awesome, really giving you a sense of power. I seriously get excited using the Slug Gunner, the sense of power is amazing. The Slug Mobile is a disappointment, and this is the one I was most excited about. You are just along for the ride when you get this. You perform a few jumps in it, and it can shoot machine guns and has bombs, but the stage is rather boring because there isn't much variety in enemies to fight against. You will come up against Missiles and a few airplanes and that’s about it. The hardest part is jumping over the gaps in the highway without hitting a missile, which will cause you to fall short and die. The Spider Slug isn't in the manual, but you will find it on stage 5, and it appears on the attract screen. This thing is fun to use, it’s kinda limited in maneuverability, but it's got dual vulcan cannons, plus a harpoon special which does massive damage to enemy vehicles. It's fun to watch the thing walk around more than anything, it’s animated really well. Gone are the Helicopter Slug, and I haven't yet seen the Bronze Slug Vehicle 001. Also the Worker Slug is gone, but the Slug Gunner like I said is the evolution of that one. Also the Ostrich Slug, Elephant Slug and Drill Slug are not here either. Again, very cool and it follows the storyline of the game. They are basically just gigantic versions of various slugs. Since this 'mysterious' organization stole all the slug secrets and plans, they are making enormous versions of them to use against you. I won't give away what they are, but trust me they are really cool and humongous. I actually like the Final Boss, contrary to some members, I think he's cool. One of his attacks is really cheap though and almost impossible to dodge, although I've managed to slip by a couple times, but only by luck. Tight control as usual. The game has a pacing problem on the first stage. When you are in the canoe and fighting against the airboats, it doesn't throw enough of them at you. There are lulls in the action, but only on that sequence. Otherwise I find the game to be intense, just like the music. There are a couple of times where the action gets intense enough to compare to the bridge stage of MS1, where you need to keep on your toes, shooting left, then right and utilizing the new 'slide' move to dodge bullets. The Slide is excellent, and its not a game breaker so don't worry. It's not an invincibility move at all; it’s just something that helps given the right situation. Besides some of the boss’s attacks, I don't really find spots that make me feel I was cheated, or where I think there are cheap attacks taking place. The stages are well laid out, there's always enough room to maneuver around, using your slide, jumping etc. The only place that seems cramped is the first stage canoe sequence, but it's the first stage, so it’s on the lowest difficulty at that point. There are plenty of Slugs to use, nicely spaced throughout the game, but I did find spots that were bare of any power-ups. There are parts of the game that are just screaming for a power-up, like stage 2 when you are meandering up the staircases, you use up your Heavy MG on some hovercrafts launching missiles, then after that you get nothing for quite awhile, and let me tell you, they throw a lot of guys and enemy slugs at you on this part. It'll make you tired killing all that stuff with the pistol. The game needs some polishing with the audio, and even though it’s intense, I could actually go for some more enemies being thrown my way at certain spots. 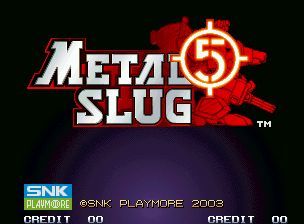 This being the last Slug on the Neo Geo certainly isn't a bad mark on the machine that’s for sure, but I'm not willing to say its one of the better ones overall. It's just got so much to live up to, and even with my praise of it, it falls short of MS1 and MS3. The game isn't nearly as long as it could have been, and there are some things that really annoy me with the way the game was programmed. For instance, like a Motion Picture, the game takes a lot of 'cuts' throughout. When changing scenery, the game just fades to black and comes back in to totally new scenery, where as in MS3, we would have actually seen the transition just by running, there would be no need to do a cut like that. Stage 2, the elevator sequence, when you finish killing the last red robot, again, the screen blacks out, then reappears with the elevator stopping...why the heck could they not program it to just slow down after the robot died, without doing a cut? There's no need for that and it bugs me. They never do a running transition in this game, when its time for a change of scenery it just has you run off the screen to the right, black out, then you reappear in a new setting, it kinda pisses me off to be honest. Still this game is worth buying, it’s a lot of fun to play, and that’s the most important thing. It keeps you excited with the music and the action, and you'll appreciate the cool new backgrounds and humongous bosses.